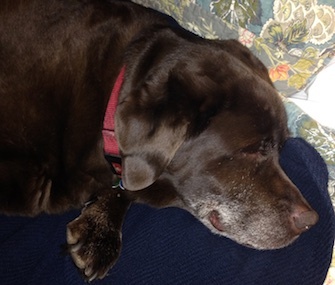 If only we could all sleep like Grizzly, a 14-year-old chocolate Lab. As I’m packing the kids’ lunches, trying to meet a deadline and squeezing in a trip to the gym, my dog is cozy in his bed, snoozing away, without a care in the world. If you’re a dog owner, I bet you’ve had the same thought cross your mind: How great would it be to be him? Here’s why I’ve often wished I could be my 14-year-old chocolate Labrador Retriever for a day. 1. All the sleep. As the owner of a senior dog, this is the most obvious to me. Grizzly’s day consists of the following: waking up, eating, then sleeping by my feet before my morning deadline. Looking for food from my daughters when they get up. Sleeping. Looking for scraps at lunch. Sleeping. Watching for possible food as dinner is made. A nap before bedtime. If I could get as much sleep as he gets for just one day, I think I would be set for the week. I’m jealous when I see how comfortable he looks in his many beds (or in my spot on my own bed), while his little feet race through his dreams. 2. No work to do. While I watch him sleep, I’m usually working, and it's hard not to feel a bit of envy. I mean, I love my job, but he has no deadlines, no sources who aren't returning his calls, no challenge to come up with new ideas. No dishes, laundry or vacuuming. He basically has nothing he has to do, just things he wants to do. (Like, as you may guess by now, sleep.) Lucky guy. 4. The little things delight him. Walks, treats, rides in the car. Breakfast, lunch and dinner. They’re merely the basics of life, but they bring such joy to dogs — every. single. day. Seeing the leash is exciting. Playing hide-and-seek with treats is exciting. Cleaning out the kids’ lunch boxes (when there are only dog-safe food bits left, of course)? Thrilling! If those things could be that mind-blowing to us every day, imagine how awesome life would be. 5. He doesn’t have a worry in the world. There is only one thing that concerns Griz: when he will get more food. But there’s not really any justification for his apprehension — he never misses a meal. And beyond that, he doesn’t seem to have anything that weighs on his mind. Then again, maybe that’s why he’s so good at taking any worries off my mind. Can You Retrain an Old Dog?